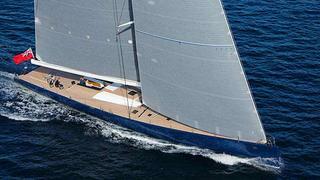 The second of Italian builder Wally‘s WallyCento sailing superyachts to be launched, 30.47 metre Magic Carpet3’s development actually started several years ago before the WallyCento box rule had been finalised. Designed to combine race performance with enough comfort to allow cruising in the summer, she is proof that top-level racing and comfortable cruising are not mutually exclusive concepts. There’s no two ways about it – Magic Carpet3 is jaw-droppingly gorgeous from any angle. A wide, flat transom, acres of teak, and a fine bow draw admiring gazes wherever she sails, but her stylish interior surprises in light of the weight-saving that was employed in her construction. 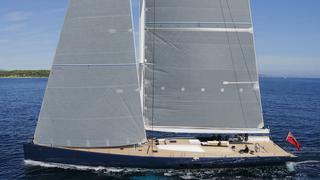 Intended as a race boat, but with occasional cruising aspirations, her performance on both fronts has not disappointed. Her owner, Sir Lindsay Owen-Jones, is no stranger either to yacht racing or to Wally – he was the very first client of Luca Bassani’s iconic Italian brand. 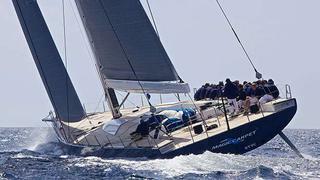 ‘For the three Wallys he has been with us,’ says Bassani of Owen-Jones, ‘he has been the client closest to myself in the philosophy and strategy of how a sailboat should be.’ Between the two of them, the WallyCento box rule emerged – giving owners some flexibility in design so each yacht could be different, while providing close, class-based action on the water. 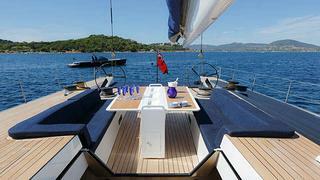 In addition, the box rule was intended to allow the yachts a second lease of life as cruising or charter boats. Simplicity and weight-saving may have been key criteria, but the interior is fresh, comfortable and practical in equal measure. ‘I needed the yacht for three things,’ Owen-Jones explains. ‘Racing, daysailing every weekend, and taking a three-week summer cruise.’ Two double guest cabins flank the central corridor, which is bisected by the keelbox. 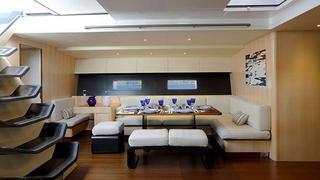 The master cabin is located forward, and the galley is aft of the main saloon, to starboard. Seating and a desk to starboard and a dining area to port in the main saloon support guest functions, and the whole is finished in contemporary style with a mix of creams and light and dark browns. 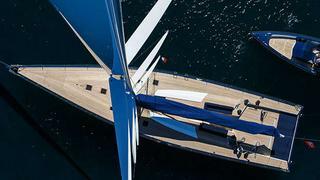 Undulating, sculpted deck spaces were not only a facet of Owen-Jones’s drive for an aesthetically pleasing yacht, they also played an important part in ensuring she remains safe and child-friendly when in cruising mode – something that harks back to the first Magic Carpet in 1997. ‘Looking at my favourite boats at that time,’ Owen-Jones explains, ‘everywhere my wife could see ways of hurting herself. But suddenly there was a way of having a racing boat with everything hidden under the deck. Each of my three yachts can be seen as an evolution.’ She offers deck space in abundance for lounging and socialising when she’s not being raced hard. The semi-sunken cockpit is both stylish and practical, while the gentle undulations in the teak just yearn to be reclined on. 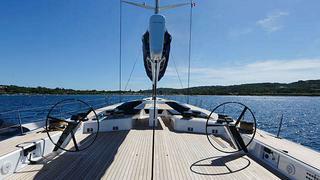 A single engine that drives a folding prop doubles as a powerpack for the deck gear and sailing systems. For the three-week summer cruise, a small generator is lifted into the boat to take care of domestic requirements such as air conditioning, but the rest of the year it is left ashore. Under sail this racer really comes alive, and on our test sail she didn’t disappoint. 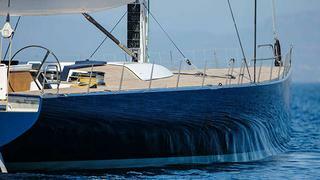 While the breeze stayed light at around seven knots true, the Carpet still flew, heading upwind at a comfortable 10 knots, and quickly accelerating to over 11 knots in just eight knots true. She feels effortless to drive. In her early races, downwind she had reached 22.5 knots against a target of 25 knots, but the crew were still playing with sail configurations at the time. She’s also a stunner even when the heat is off. ‘She’s turned out to be a surprisingly easy cruising boat,’ enthuses Owen-Jones.